About 10 miles south of Boothbay Harbor off Route 27, situated on the mouth of the Sheepscot River in Cozy Harbor on Southport Island. Private residence. Built in 1829 and then rebuilt in 1875. Hendricks Head is probably best known more for its two sensational stories that occurred there. The first incident, which involves a famous rescue of an infant, occurred around 1875, during a fierce March Gale, when Keeper Jarul Marr saw a vessel run aground about a half mile from the lighthouse. Unable to launch his dory in the fifteen-foot seas, he and his wife managed to light a bonfire to signal the vessel. As he was feeding the fire he noticed a large bundle floating in the waves. When he waded in to retrieve it, he found there were two feather beds tied together. When he ripped them apart he found a box with a crying baby girl. After rushing the infant to the house he went back out to try and signal to the boat but it was too late. The seas had smashed the vessel to pieces with no survivors. The baby girl, named Seaborn, was believed to have been later adopted by a doctor and his wife who were summer residents living nearby. This story has been disputed but ancestors of the keeper believe it is actually true. The second incident involves an affluent woman stranger. In the early 1900's, keeper Charles Knight, while heading to the Post Office, noticed a dignified woman walking in the opposite direction. In a small town where everyone knows one another, he found this quite odd for a stranger to be walking alone in the dark. The postmaster also had seen the woman. The next day her body, weighted down with a flatiron, was found washed ashore at Hendricks Head. No one ever found out who she was, but she was given a decent burial in Southport. Some people have claimed to have seen her ghostly figure in the winter months walking the deserted beach where she had believably committed suicide. She is known as the "Ghost Lady of the Dusk" as she has been spotted as the sun sets. A fierce storm on January 9, 1978, demolished the boathouse and also destroyed the walkway that had connected the lighthouse to the fog bell tower. In 1991, the present owners, the Russels, bought the lighthouse property, and have restored all of the structures to their original condition for tourists to enjoy from a short distance away. Hendricks Head Lighthouse can easily be viewed for good photos as you park your car on the side street by a small beach just before the lighthouse. The beach is open to the public if you can find adequate parking there. There is a little hiking trail through the woods on the right side just before you come to the small beach. The Hendricks Hill museum near the Southport post office provides lots of history in the area, and, if you look carefully above the fire station you'll find a replica of a lighthouse tower. If you are looking for automobiles that encompass all historical eras from horseless carriages, to steam powered vehicles, to the streamlined cars of the 1930's, and ending with the superb craftsmanship of a Rolls Royce, and on the ground of a historic village, an operating live steam train, visit the Boothbay Railway Village. 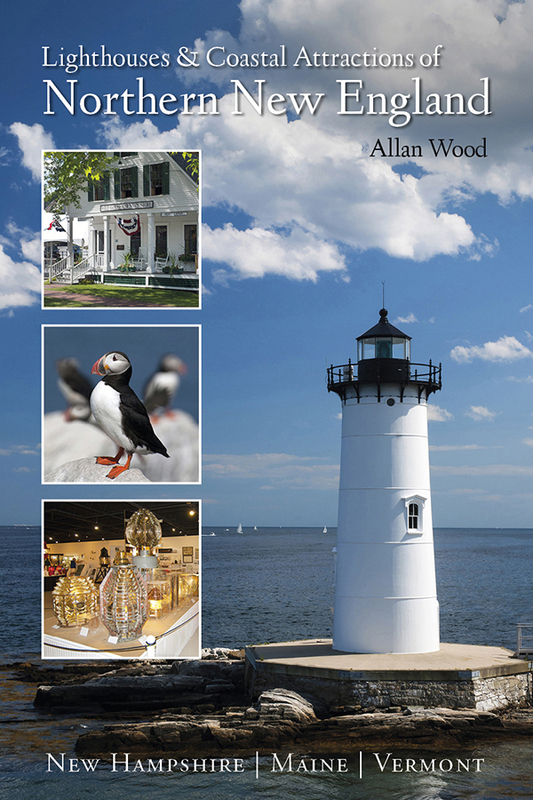 The Boothbay Harbor region offers plenty of curio and specialty stores, quaint inlet harbors, with small coastal villages, like Southport, with plenty of local B&B’s to rest in. If you have your own boat, there are plenty of places to dock, some by shoreline restaurants. 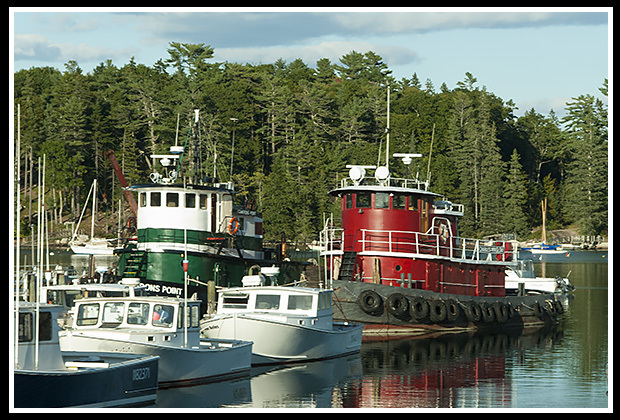 Boothbay Harbor was originally a fishing and shipbuilding village, and it still operates the same way today. Many tours out of Boothbay Harbor pass by the lighthouse. 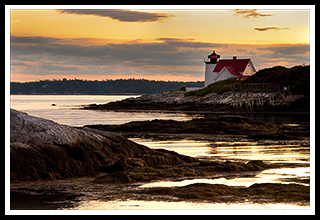 You'll find plenty of boat cruises leaving out of the harbor for fishing, whale watching, and lighthouse tours covering the Kennebec River area and around Penobscot Bay leaving out of Boothbay Harbor. If you’re looking for one of the best lobster rolls, stand in line in front of the bridge at Red’s Eats; it’s worth the wait. From US Route 1, after crossing the bridge at Wiscasset, take Route 27 South through Boothbay Harbor towards Southport. You'll find Lakeside Drive on the right about ten miles from Boothbay. After about 2 1/2 miles when you round a curve you'll see a small rotary around a monument by Southport Grocery Store. Take that sharp right in front of the store and then follow Beech Road for about 3 miles till you come upon the lighthouse. It is privately owned now but there is a small beach just before it where you can park and view the lighthouse, and catch a nice tan. Boat cruises out of Boothbay Harbor and the Kennebec River may offer many types of cruises that pass by Hendricks Head Lighthouse. While some may offer specific lighthouse cruises, some will pass by specific lighthouses as part of charters, narrated wildlife and historic tours, ferrying passengers, whale watching, fishing tours and other types of excursions. Weather is also a major factor in New England, especially on sailing excursions. Contact info is provided to help you plan your special trips ahead of time and to answer questions before you arrive at any of New England’s destinations. Enjoy! In the book, you'll find more in-depth info and accounts of the mysterious woman whose death prompted sightings afterwards as the "Lady Ghost of the Dusk", and of the famous miracle baby rescue. There is a section in the book about haunted lighthouses too.